Poet and activist Elhabibe Alamin continues to fight for the princples of the Libyan uprising. BENGHAZI, LIBYA – Not every poet gets to argue the inner meanings of his poems with an interrogator from the Libyan intelligence service. Elhabib Alamin did. The writer and poet actively opposed dictator Muammar Gaddafi for years. Last year, he published “Me and My Burning Oven,” a poem fraught with metaphors about the Libyan people’s heated resistance to Gaddafi. The secret police hauled him in for questioning. He wound up in jail soon after as the Gaddafi regime cracked down on the opposition movement here in Benghazi, where Alamin lives. Alamin spent seven months in prison, earning his freedom only when the people of Benghazi expelled Gaddafi’s forces. 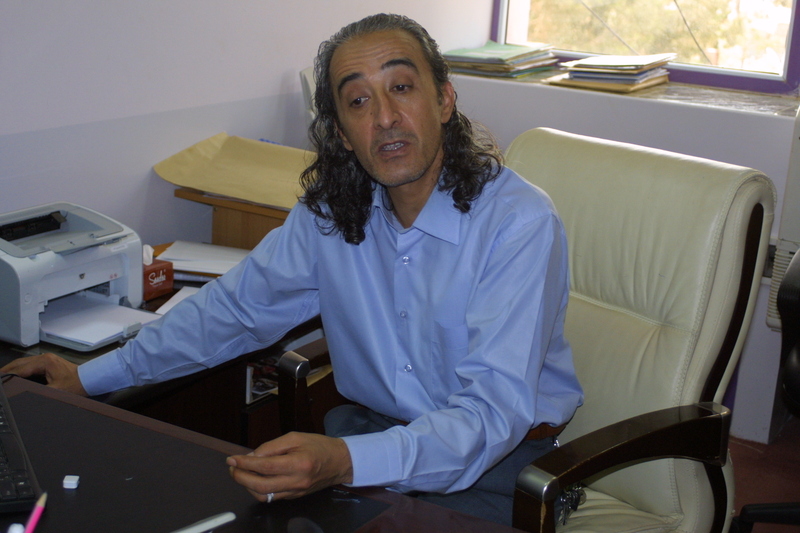 These days, Alamin heads Benghazi’s cultural department and is an official in the national Culture Ministry. But he remains a political activist by necessity. Having fought hard against Gaddafi, he like many Libyans feels concerned that western powers will abandon Libya’s struggle for democracy. Foreign governments are happy that oil production is almost back to pre-war levels, he noted, but armed militias have more power than the central government. “I don’t want Libya to become an ATM for western oil companies while they abandon the people of the country,” he told me. The U.S. and NATO allied with local militias to defeat Gaddafi. The militias were supposed to dissolve months ago and join the national army. But so far, more than 60 have not. Some have become extortion racketeers. Still others push their political demands through armed force. On May 8th, a Berber militia drove to the prime minister’s office in Tripoli demanding payment for their service in the anti-Gaddafi struggle. They also wanted the government to send wounded veterans abroad for medical treatment. The militia began firing anti-aircraft cannons and rocket-propelled grenades at the office, trapping the prime minister for two hours before militias allied with the government arrived and fought off the attackers. On June 4th, yet another militia seized control of the Tripoli airport to demand release of its arrested leader [click on the 6-5-12 tab]. Militiamen blocked the runways and forced passengers off commercial planes. Pro-government militias forced out the militiamen. The national army and police never showed. The National Transitional Council, the coalition set up with blessing of the U.S. during the anti-Gaddafi campaign, has a tenuous grip on power. The NTC appointed an interim government earlier this year. In an interview, Minister of Economy Ahmed Alkoshli sounded almost apologetic about the attack on the prime minister’s office. Libyans were scheduled to go to the polls June 19th to elect a National Assembly, which in turn would select a new government and appoint drafters of a new Constitution. But the interim government postponed the elections until July 7th. Many Libyans say elections, when they do happen, won’t solve the country’s problems. The elections may worsen the militia problem. Militias have begun to ally with political parties. People like poet Alamin fear those parties will siphon off government funds to pay for militia weapons and salaries, leading to a system where warlords and a pro-Western autocrat vie for power, as happened in Iraq and Afghanistan. Alamin continues to write poetry and is getting tired of paper shuffling at his Culture Ministry job. He hopes to go back to political activism and writing full time. He feels freer to write than he has in decades. And the seasons of abundant grain. Oh wheat mill who carved you? Who sifted the flour and tossed away the chaff? And who produced the brown loaf of barley?